If you’re visiting Germany then you want to do it right. Germany’s history has been dotted with castles and for many years, most of the population lived in and around them. There are more than 20,000 castles and palaces located in Germany and many of them have been transformed into hotels that you can stay at during your trip to the country. Best of all, most of them are relatively affordable which means that pretty much anyone can stay at one. If you are taking either the romantic road or the castle road in Germany, you will be visiting the Colmberg Anyway. The castle is more than 1,000 years old and steeped in history. It features stone towers, ramparts, stables and even a deer reserve. Should you ask for a medieval room, you will be provided with a room with four poster beds, antique furniture and wooden ceilings that would delight any fan of the medieval. Rooms start at only 75 euro per night which is a steal for the experience. Castle Sababurg – This castle is possibly one of the most romantic places that you can go in Germany. Said to be the original setting of the legend of Sleeping Beauty, the Castle Sababurg is steeped in romance and idyllic romance. 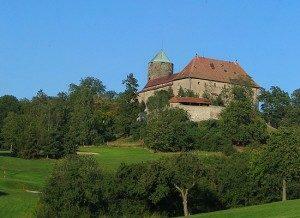 The Castle Sababurg is also very near to the German Fairy Tale Road which highlights the tales of the Brothers Grimm. The castle is 650 years old but still as sturdy, romantic and majestic as it was when first built. Castle Hotel Auf Schönburg – For just 95 euro per night you could enjoy one of the most stunning and romantic castle hotels in Germany. 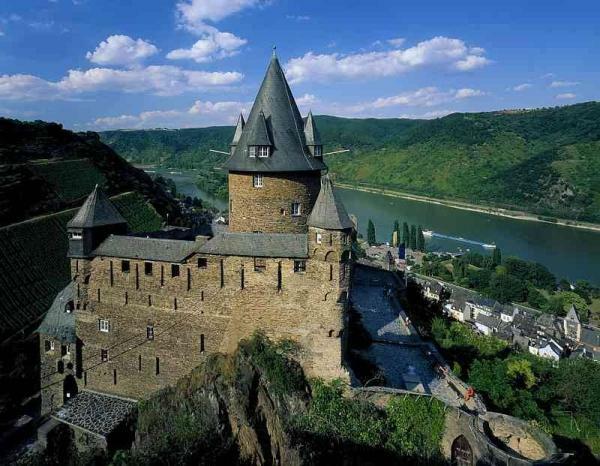 The Schonburg sits astride a hill with stunning views of the Middle Rhine Valley. The castle features a public library, a romantic candle lit restaurant, two terraces and a tower room that is available for a slightly more expensive price. No matter what room you get at the Schonburg, you are offered beautiful scenery, romantic living and all the majesty of the castle. Castle Hotel Liebenstein – This castle is run by the family Liebenstein. The hotel offers beautiful views of sweeping landscapes including mountains, valleys and rivers. The hotel itself is a masterpiece of architectural design. You can also see another castle from some of the windows (also belonging to the Liebenstein family). The river pier where Rhine cruises depart daily is only a few minutes’ walk from the hotel. Rooms start at 105 euro per night. Castle Hostel Stahleck – Castle Hostel Stahleck was recently refurbished and transformed into a hostel. The Castle offers high quality meals, German wines (and beers) and stunning views of both the architecture and the countryside. While the rooms aren’t medieval, they are quite cheap and start at only 17 Euro per night for a dorm or a slightly higher price for a full room. If you don’t plan on visiting any of the castles listed here, you can check the area you are visiting. There are thousands of castle hotels in Germany and there is sure to be one near your vacation area! The “German Castle Hotels” article was produced by Matt Graham; his client runs a quality hotel comparison website. They are currently promoting their Berlin accommodation page which has over 500 different hotels in the Berlin area.